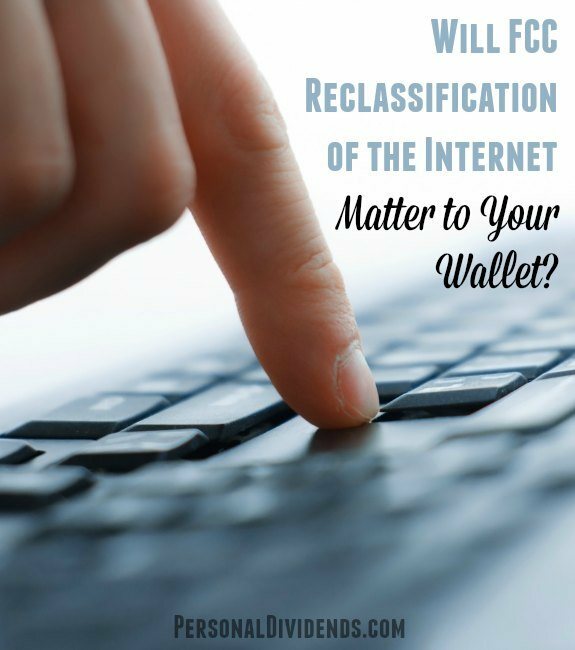 Will FCC Reclassification of the Internet Matter to Your Wallet? One of the more interesting developments in recent months was the announcement by the Federal Communications Commission that it will reclassify the Internet as a public utility. Champions of Net Neutrality celebrated the idea that the FCC reclassification is expected to prevent Internet Service Providers (ISPs) from charging extra for faster data, and from blocking some content, while telecoms (and the politicians they lobby) are fretting over the fact that they won’t be able to squeeze even more out of consumers and businesses. The treatment of data by ISPs been an ongoing debate for several years now, especially as the Internet becomes more ingrained in our everyday lives. From streaming entertainment to the way we stay connected to others, it’s clear that the Internet is vital to our society. So it makes sense that it is treated as a utility. But does the FCC reclassification really matter? Will it truly make a difference in the long run? Michael Bremmer, the CEO of Telecomquotes.com and someone in the telecom industry for 20 years, doesn’t think that a whole lot will actually change. I think it would be nice if telecoms paired these service price increases with better networks and service, but I’ve got a long wait for that to happen. Instead of working to improve service and systems, telecoms instead fight municipalities that try to provide better alternatives, and try to squash competition. There’s a reason that consumers in the United States pay more for their broadband service than those in other developed countries — and our service is crappier than what other countries have as well. Bremmer is probably right when he says that prices will rise regardless. Telecoms are interested in holding on to their practical monopolies, and not interested in actually providing what the market continues to ask for. Not much to change there. You only have to look at the way Google displays its results to see an advantage to the bigger brands — regardless of how useful they are. Plus, bigger brands have more money to spend on prime placement as Google’s display continues to favor sponsored results over organic results. However, Bremmer makes a point that Net Neutrality rules do provide more of a chance for the little guys. And it should slow the ability of ISPs (like Comcast) to block out content from its competitors while trying to extort them into paying even more (and probably having to pass the costs on to you). In the end, though, Bremmer thinks that most of these issues will be somewhat moot in a few years anyway, thanks to the rise of mobile browsing. “Since Internet browsing is going mobile, we’ll end up with some sort of prioritization because there are physical limits with the wireless spectrum that aren’t there with wired connections,” he says. Mobile is rapidly changing the way we interact online, and the Net Neutrality debate might not matter that much in the end. By the time it gets sorted (and it could go all the way to the Supreme Court), we might have something else to be concerned about. In the meantime, consumers can expect more of the status quo: Being forced to accept subpar broadband Internet service from a regional monopoly — and paying too much for it.